It takes 41 minutes for Jack Bauer to talk in the newest episode of 24—and for each of those 41 minutes, you can't help but wonder if he's still got it. Is this still Jack Bauer? Are we still watching the living incarnation of video-game god-mode? Can this guy really save the world in under a day? Then, a handcuffed Jack uses his own shackles to choke out a federal agent, he steals that agent's gun, and without missing a beat, he points it at a CIA torturer. "Take me to her," he barks. "Now." By the end of last night's riveting—and ridiculous—two-hour premiere of 24: Live Another Day, it's clear that this is 24 through and through. An hour and 40 minutes into the season, which will run for 12 episodes, Jack and his old buddy Chloe are already back in the field, swapping zingers and wiping out cameras like they've done this a thousand times before. Only thing missing is someone setting up a perimeter. This time we're in London, where Bauer is trying to save the president; Chloe is trying to impress her British hacker buddies; and terrorists led by Catelyn Stark now have control of U.S. drones. Also there are cameras, and interrogations, and Audrey Raines, wooden as ever, who is now married to the president's chief of staff, a slick-haired sleazeball whose "turns out to be a mole" odds wouldn't even be discussed by any respectable bookie. It's not made quite clear what Jack's been doing these past four years. He's got a buddy in the Serbian mob now, though, and something tells me we'll hear more about his recent activities in the episodes to come. Jack Bauer isn't the type of guy to just sit around for half a decade waiting for something to happen. Dude's restless. And, yeah, at the beginning of the first episode, which kicks off at 11am, Bauer looks gaunt. Disturbed. For nearly an hour he's scowling, and we've never seen him look this angry before—four years without his daughter has transformed Jack from "miserable psychopathic hero" to "miserable psychopathic hero who has lost all contact with the real world." "I have no friends," Bauer says at one point. Later: "There's no going back for me." Hopefully, somewhere among the torturing and explosion there's enough time to explore more of Bauer's darkness; 24 is at its best not when it's parading around infrared cameras and self-destruct programs but when Kiefer Sutherland is tapping into the deep sadness that drives Jack Bauer to do what he does. For all of this show's ridiculousness, Bauer's emotional arcs have always been touching, and I've always been impressed by Sutherland's ability to seamlessly swap between "TELL ME WHERE THE DEVICE IS!" and "I DON'T KNOW HOW TO DO THIS ANYMORE!" So far, thankfully, there appear to be no nonsensical filler plots like Erin Driscoll's suicidal daughter or the infamous Kim Bauer cougar. There's plenty of nonsensical technobabble, though, like always. REAL-TIME TRACKING. Everything's just like you remember it four years ago, from split screens to plot beats (someone close to the president MIGHT BE LYING). Really, the only thing new about 24: Live Another Day is that everyone drives on the left. And as the clock of season 9, episode 2 of 24 ticks to a close, any longtime Bauer fan knows exactly what's coming. PLOT TWIST. Someone just betrayed someone else. DRAMA. The clock ticks down. BEEP. BLOOP. BEEP. BLOOP. 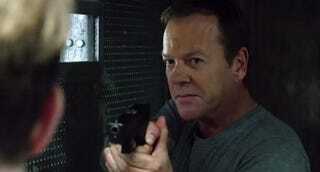 Ridiculous Jack Bauer Quote of the Week: "I can tell you think you're a pretty intimidating group. You probably think I'm at a disadvantage. I promise you I am not."